Last week, Numismatic Guarantee Corporation Chairman Mark Salzberg posted a letter saying that starting in January 2017, the NGC Registry will only accept NGC-certified coins. In the past, NGC would accept coins graded by Professional Coin Grading Service in the registry. They did this while PCGS only accepted their own coins. This created a lot of options for collectors. Many of the registry collectors have tried to use only NGC-graded coins as a source of pride. Others have been looking for the best coin for their sets. I had started a few registry sets based on the 1975-76 Bicentennial coins. After a few years, I had stopped working on the set while other things took priority. Since I had not looked in a while, it appears that overall, I rank 4,653 with a total 12,050 points. While I know that the point values change based on population, I am not sure how this has changed. What has not changed is my America’s Bicentennial Celebration set, a 1776-1976 Clad Mint Set. According to NGC, the set is still ranked THIRD in this category with a score of 3,883 points. During the last few years, I have divested many of the coins I purchased for registry sets except for the Bicentennial coinage. As part of the change, Salzberg’s letter said that coins from “other services” that have been added prior to the change will be allowed to remain. In this case, the other services would be PCGS since it was the only service allowed in registry sets. Salzberg said that there will be no point deductions for those coins. Unfortunately, I must have missed something because while looking at my sets, my 1776-1976 Silver Mint Set should be a top set but is made up of all PCGS coins. If PCGS coins are still allowed, then why are these coins not counted? Time to sent NGC a note and ask! Frankly, I am surprised NGC has waited this long to make this change. As the quality of the coins and the number of people participating in registry sets have increased, NGC should have considered this move a few years ago. After all, PCGS does not accept NGC-certified coins in their registry. In thinking about the competition between the two services, it is interesting that Salzberg noted that there will be some who will be upset “but I cannot continue to allow coins graded by companies whose standards do not match those of NGC.” Since the only non-NGC graded coins allowed in the sets are from PCGS, is this a commentary on PCGS? Aside from questions that caused the formation of the Certified Acceptance Corporation as the “third-party grading service verifier,” or a fourth-party grading service, there have been some that claim PCGS has lowered their standards to grade more coins at higher grades to make their service more attractive. One dealer pointed out that it was once very rare to submit American Eagle bullion coins to PCGS and receive more than 5-percent graded as a 70 (perfect). Now, if at least 25-percent do not come back with a 70 grading he wonders if there was something wrong. 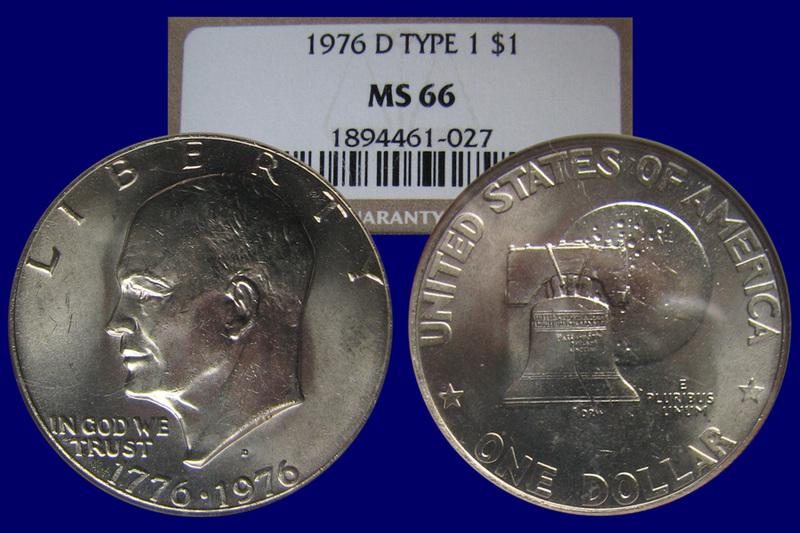 Another dealer pointed to high-profile online dealers who pre-sell 70 graded coins from both services. How do they know that the services are going to be able to supply these companies with the appropriate inventory? One said that they expect a certain number to come back with the perfect grade based on a percentage of what is submitted, noting that it is easier to predict. I have no problems with registry set collecting, competition, or NGC only allow coins they graded in their competition. It is their Registry Service and they can set whatever rules they want. I now have to consider whether I want to try to cross-over the PCGS coins or buy new coins. Image of Mark Salzberg courtesy of NGC. We end numismatic 2012 almost the same way as we began, discussing what to do about the one-dollar coins. The over production lead to a quite a number of bills introduced in congress to try to fix the perceived problem but none ever made it to a hearing, let alone out of a hearing. Rather, the U.S. Mint hired Current Technologies Corp. (CTC) to perform an alternative metals study required by congress. When the U.S. Mint finally published the report and a summary they made a recommendation to study the problems further because they could not find suitable alternatives to the current alloys used. While reading the summary gives the impression that the request is reasonable, the full 400-page report describes the extensive testing and analysis that the U.S. Mint and CTC performed leaving the reader curious as to why they were unable to come to some sort of conclusion—except that there is no “perfect” solution. This is a story that will continue into 2013 and be on the agenda for the 113th congress when it is seated on January 3, 2013. The other part of the discussion is whether or not to end the production of the one-dollar Federal Reserve Note. It was the last hearing before the House Financial Services subcommittee on Domestic Monetary Policy and Technology for Rep. Ron Paul (R-TX) and the 112th congress that will certainly carry over into 2013. This does not mean the Bureau of Engraving and Printing is without its controversy. In order to comply with the court order as part of American Council for the Blind v. Paulson (No. 07-5063; D.C. Cir. May 20, 2008 [PDF]) and the subsequent injunction (No. 02-0864 (JR); D.C. Cir. October 3, 2008 [PDF]), the BEP has been working to provide “Meaningful Access” to United States currency. Secretary of the Treasury Timothy F. Geithner approved the methods that will be used to assist the blind and visually impaired to U.S. currency on May 31, 2011. In addition to examining tactile features, high contrast printing, and currency readers, the BEP issued a Request for Information for additional information to implement their plan. The BEP will be participating at stakeholder organization meetings to socialize and refine their plans. There will probably be few announcements before the conventions of the National Federation of the Blind and American Council of the Blind this summer. Another building controversy from the BEP is whether the redesigned $100 notes will find its way into circulation. Introduced in April 2010, full production has been delayed because of folding during the printing process. The situation has to be so severe that the BEP has not announced a new release date and delayed releasing the 2011 CFO Report [PDF] to the end of Fiscal Year 2012 while finding a way to bury the scope and costs of the delays. Will the redesigned $100 Federal Reserve Note be issued in 2013? Stay tuned! Staying with currency issues, there should be a new series of notes when a new Secretary of the Treasury is appointed. It is known that the current Secretary Timothy F. Geithner wants to pursue other options. If the BEP follows its past practice, notes with the new Secretary of the Treasury’s signature would be Series 2009A notes. There have been no reports as to whether Treasurer Rosie Rios will continue in her position. As for other products, the BEP will continue to issue specially packaged notes using serial numbers that are either lucky numbers (i.e., “777”) or ones that begin with “2013” as part of their premium products. Of course they will continue to issue their sets of uncut currency. Another carry over from 2012 will be whether the U.S. Mint will issue palladium coins that were authorized by the American Eagle Palladium Bullion Coin Act of 2010 (Public Law No: 111-303 [Text] [PDF]). The law requires that the U.S. Mint study of the viability of issuing palladium bullion coins under the Act. That report was due to congress on December 14, 2012 but has not been made public at this time. Bibiana Boerio was nominated to be the Director of the U.S. Mint. One final bit of unfinished business from 2012 is the nomination of Bibi Boerio to be the 39th Director of the U.S. Mint. The former Chief Financial Officer of Ford Motor Credit and Managing Director of Jaguar Cars Ltd. has recently been a Special Advisor to the President of the Detroit Regional Chamber of Commerce while waiting for the Senate to confirm her nomination. The Senate will have quite a few presidential nominations on its agenda that will he taken up in the new congress. Other than the higher prices for silver products, the U.S. Mint should not generate controversies for its 2013 coin offerings. There will be no changes for the cent, nickel, dime, and half dollar with the half dollar only being struck for collectors since it has not been needed for circulation since 2002. These coins will be seen in uncirculated and proof sets with silver versions for the silver sets. There has been no confirmation from the U.S. Mint whether they will strike San Francisco “S” Mint quarters for the collector community as they did in 2012. The U.S. Mint has not released designs for these coins at the time of this writing. The 2013 Native American $1 Coin will feature a reverse commemorates the Delaware Treaty of 1778. Since the dollar coin does not circulate, only collectors have enjoyed the great designs of this series since it began in 2009. American Eagle coin programs will continue with the bullion, collector uncirculated, and proof coins for both the silver and gold. The American Eagle Platinum bullion coin will continue to use its regular reverse while the American Eagle Platinum Proof will continue with the Preamble Series. The Preamble Series is a six year program to commemorate the core concepts of the American democracy as outline in the preamble of the U.S. constitution. For 2013, the reverse will be emblematic of the principle “To Promote the General Welfare.” The U.S. Mint has not issued a design at this time. Currently, there are no announced special products or sets using American Eagle coins and no announced plan for special strikings such as reverse proofs or “S” mint marks. Finally, we cannot forget the American Buffalo 24-Karat Gold Coins that will be available as an uncirculated coin for the bullion/investor market and a proof coin for collectors. And I bet you thought that 2013 would be a mundane numismatic year! The original Star-Spangled Banner, the flag that inspired Francis Scott Key to write the song that would become our national anthem. The War of 1812 affected the international political framework and represents what many see as the definitive end of the American Revolution. Although 30 years had passed since the Americans had won freedom from Britain, the young nation continued to be plagued by British occupation of American territory along the Great Lakes; highly unfavorable trade restrictions; the impressment (forcing into service) of American sailors by the British; and the suspicion that the British were backing Indian raids on the frontier. It seemed that Britain continued to regard America as a set of troublesome colonies, rather than a nation of equal standing to Britain. President James Madison, embroiled in a tight campaign for re-election, acquiesced to Congressional “war hawks” from the south and west and declared war on Britain in June 1812. Americans were emboldened by the fact that the British were deeply committed to a war with Napoleon Bonaparte that strained the resources of the crown. There was little acknowledgement in Washington that what passed for a standing army was only about half the size of Britain’s and stationed in widely scattered outposts; that the American Navy totaled about 50 ships to Britain’s more than 850; that coastal defense infrastructure was limited at best; and that there was no core of trained military officers to lead the poorly trained troops and militia. The British ships were much larger than their American counterparts. Commercial and political interests in New York and New England, concerned about the potential destruction of shipping, opposed the war and in fact, continued to supply the British until the naval blockades were extended. Similarly, Britain saw America as an important market and supplier and only reluctantly responded to the declaration of war. In the summer of 1812, American troops attempted to invade and conquer Canada. The poorly planned campaign ended in defeat and the withdrawal of the Americans. However, two American frigates, the USS Constitution and the USS United States, gained victories in naval battles, boosting American morale and contributing to President Madison’s re-election. In response, the British gradually established and tightened a blockade of the American coast south of New York, impairing trade and undermining the American economy. The attempts to invade Canada during the spring and summer of 1813 were somewhat more successful than the previous year’s, yet they ended in stalemate. By the end of the season, the British blockade had extended north to Long Island. Remarkably, the young nation prevailed despite a long summer in the Chesapeake region. The British harassed citizens, burned towns and farms, and overwhelmed the scant American naval forces and militia. With the Americans distracted and largely unprepared, the British entered the nation’s capital and burned several public buildings, causing the President, his family and Cabinet to flee Washington. In September, however, an all-out land and sea defense of Baltimore forced the withdrawal of the British from the Chesapeake region. The same month, the British fleet in Lake Champlain was destroyed, leading to the British retreat into Canada. This defeat convinced the British to agree to a peace treaty, known as the Treaty of Ghent, with very few conditions. In January 1815, with neither side aware that the treaty had been signed the previous month, the British decisively lost the Battle of New Orleans. David had defeated Goliath. The War of 1812 represents what many see as the definitive end of the American Revolution. A new nation, widely regarded as an upstart, successfully defended itself against the largest, most powerful navy in the world during the maritime assault on Baltimore and later at the Battle of New Orleans. America’s victory over Great Britain confirmed the legitimacy of the Revolution; established clear boundaries between eastern Canada and the United States; set conditions for control of the Oregon Territory; and freed international trade from the constraints that had led to the war. America emerged from the war with an enhanced standing among the countries of the world. The war served as a crucial test for the U.S. Constitution and the newly established democratic government. In a bitterly divided nation, geographically influenced partisan politics led to the decision to declare war on Great Britain. Unprepared for war, under-financed, threatened by secession and open acts of treason, the multi-party democracy narrowly survived the challenge of foreign invasion. The 2012 Star-Spangled Banner Commemorative Coins are being sold by the U.S. Mint with the proceeds from the sales ($35 for each gold coin and $10 for each silver coin) to support the Maryland War of 1812 Bicentennial Commission. 2012 Star-Spangled Banner Gold Commemorative Obverse depicts a naval battle scene from the War of 1812, with an American sailing ship in the foreground and a damaged and fleeing British ship in the background. Designed by Donna Weaver and engraved by Joseph Menna. 2012 Star-Spangled Banner Gold Commemorative Reverse Depicts the first words of the Star-Spangled Banner anthem, O say can you see, in Francis Scott Key’s handwriting against a backdrop of 15 stars and 15 stripes, representing the Star-Spangled Banner flag. Designed by Richard Masters and engraved by Joseph Menna. 2012 Star-Spangled Banner Silver Commemorative Obverse depicts Lady Liberty waving the 15-star, 15-stripe Star-Spangled Banner flag with Fort McHenry in the background. Designed by Joel Iskowitz and engraved by Phebe Hemphill. 2012 Star-Spangled Banner Silver Commemorative Reverse depicts a waving modern American flag. Designed by William C. Burgard III and engraved by Don Everhart. The commission will use these funds to support its bicentennial activities, educational outreach, and preservation and improvement of the sites and structures related to the War of 1812. Help support the commission’s activities by purchasing a commemorative coin today! Main text was adapted from Star-Spangled Banner National Historic Trail Feasibility Study and Environmental Impact Statement , National Park Service, U.S. Department of the Interior, Northeast Region, March 2004. 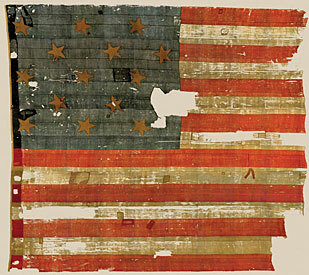 Image of the 15 Stars and Stripes Star-Spangled Banner courtesy of the Smithsonian Institute. It was a hot day in Philadelphia when the First Continental Congress met on July 4, 1776 to finalize a resolution that would permanently separate the American colonies from the British Crown. According to the leaders of the day, it was the only way to rid themselves of the unfairness of British rule. In order to ensure that everyone was heard, the Congress adjourned and met as a Committee of the Whole to debate and adopt the resolution. President Gerald Ford Speaking at Freedom Park in Charlotte, NC on May 20, 1975. After each state cast one vote in favor of the Declaration before the Committee of the Whole, the committee was adjourned. The measure was brought before the full First Continental Congress who voted in favor of the Declaration. Although independence was declared from England it would not be fully realized until 1783 when the Treaty of Paris was signed. Thirty-three years ago, the United States celebrated its Bicentennial with a big celebration. As part of the celebration, the US Mint issued special circulating commemoratives honoring the occasion. For those of us who were born at the end of the Baby Boom generation, this was the first change in coinage we experienced. It was a great experience, especially when I shook hands with President Gerald Ford during a public appearance in Charlotte in 1975. In honor of the United States Independence Day Celebration, here is my collection of Bicentennial Silver Proof Coins autographed by the artists whose designs were used. Have a Happy and Safe Independence Day and please thank any active duty military service person or veteran today! Image of President Ford speaking at the Charlotte, N.C., bicentennial celebration on May 20, 1975, courtesy of Andy Burriss Photography. With the Baltimore Coin and Currency Convention coming at the end of the month, I realized I did not talk about the last show I attended. That show was a while ago and would not be interesting now. What is interesting is one of the items I found while walking the bourse floor. Whenever I go to a coin show, I look for something “neat.” Something different that was not expensive but would raise an eyebrow or two when I show the item to others. Last summer, I found an 1803 Large Cent with a barely readable date. There was also the GSA Softpack I picked up at the ANA National Money Show in Charlotte. Before attending to the last Baltimore show, I decided that I would concentrate on my 1976 collection and look for numismatic-related items. With that in mind, I was walking the bourse floor looking at the various tables and found a set of medals in a plastic holder. The blue set caught my eye when I focused in and saw that the set was from 1976. I stepped up to the table to take a closer look and found that it is the 1976 ANA Convention Medal Set. Back when the ANA held one convention per year, this set consists of pewter, bronze, and copper medals showing the image of the a bust of the Statue of Liberty in front of United Nations building. The medals for the 85th Anniversary convention also featured the star logo of the American Revolution Bicentennial Association (ARBA) and are stored in a custom case made by Capital Plastics. This set registered high on the “oh, neat” meter. It was from 1976, had the ARBA logo, and would also fit in my New York collection. When the dealer said he is selling the set for $15, I did not hesitate to reach in my pocket for the money. As I learned more about the set, some collectors were offering four-to-five times the price I paid. The set is not for sale, but it is nice to know that I cherry picked a nice item. I can only wonder what I will find at the end of this month. Stay tuned! I know there has been a lot of news on the numismatic front. I know the spot price of gold closed at over $800 per ounce. But it is the weekend and it is time for some fun. Since this is my blog, I want to show off some recent finds—especially since I have not done that in a while. In a previous post, I discussed competitive collecting 1976 coinage. These are the Washington Quarters, Kennedy Halves, and Eisenhower Dollars with the special reverse to commemorate the American Revolution Bicentennial. These coins are of great interest because they are the first change in coinage following my interest in collecting. In fact, I continue to search change looking for the Jack Ahr Drummer Boy design on the reverse of the Washington Quarter. Not including commemorative coinage, the change in location of mint marks, or a change in alloys, this was the first temporary change in coin design on a continuing series. Aside from competitive collecting, I would like to put together a competitive exhibit for an ANA convention about the 1976 coinage. In order to do that, I need a few “wow” items. Sure, I have the history—including copies of the laws that authorized that various coins—but there has to be a real eye catcher. I think I found it. How about three PCGS slabbed, gem proof coins with the labels autographed by the artists who designed the reverses! These are three beautiful coins with very deep cameos placed in the slabs with the reverse facing the front and the autograph of the artists on the label. After winning the quarter and half-dollar very easily in a Teletrade online auction, it had taken another three months to win the Dennis Williams designed dollar. But looking at this set, it was worth the wait! This is the first coin find posts of this weekend. Have a good weekend and stay tuned for a few other items that fit my “oh neat” criteria. What do you use as a price guide when buying your coins or currency? Coin Collectors Blog by Scott Barman is licensed under a Creative Commons Attribution-NonCommercial-ShareAlike 4.0 International License.